"Nuku Nuku is ready for takeoff!" Cat girl fans rejoice, as ADV delivers the entire six-episode series of the highly popular All Purpose Cultural Cat Girl Nuku Nuku to DVD in this single collection. 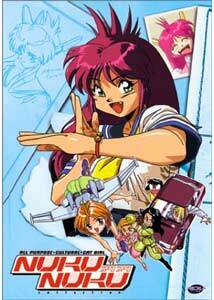 Originally released in 1992 as two three-part OVAs. Nuku Nuku was created by Yuzo Takada (Blue Seed, 3 X 3 Eyes), and features character designs by Yuji Moriyama (Maison Ikkoku, Project A-ko). As the trailer states, it is a heartwarming tale of a a boy and his cat... and a major military equipment manufacturer. Ryunosuke Natsume is of a dysfunctional family, big time. His father, Kyusaka, is a cybernetic engineering genius who has made a major breakthrough in robotics with the NK-1124 android, financed by Mishima Heavy Industries, an extremely powerful company run by Ryunosuke's mother, Akiko. Unfortunately, when Kyusaka discovered that the top secret robot was to be used by their military hardware division as the ultimate fighting tool, he kidnapped it and took off with his son, and is now on the run from his estranged wife, who will stop at nothing to get Ryunosuke back. And so our story opens. Through the six episodes of All Purpose Cultural Cat Girl Nuku Nuku the story of this bizarre family unfolds, taking many an unexpected and hilarious twist along the way. It is surprising just how much ground this series covers in so little time, building a strong collection of characters and scenarios that are highly entertaining. The Japanese voice acting, helmed by Megumi Hayashibara, is excellent, and while ADV's new dub is decent (keeping the "pap-san" and "mama-san" of the original), it doesn't have quite the same charm. Although the artwork shows its early 1990s heritage in the designs, the animation is very good, and the scripting is well above par. If you're looking for an action-packed comic misadventure, All Purpose Cultural Cat Girl Nuku Nuku fits the bill purrfectly. Image Transfer Review: Image quality is very good for an early 1990s show. The show makes good use of color, both vibrant and more subdued, which is rendered well, an black levels are solid. There is little in the way of aliasing, and print defects or cross coloration were virtually nonexistent. ADV also retained the original Japanese logo, with a soft subbed translation. Audio Transfer Review: Original Japanese and English dubs are presented in stereo. While not the most dynamic mixes, both tracks sound very good, with a fairly full and even sounding frequency spectrum, moderate use of directionality, and clear, easily discernable dialogue. No technical deficiencies were noted. Extras Review: Menus follow a Mac desktop theme. Extras include clean opening and closing credits, a nice 10 image gallery, with manga rather than the usual anime style art, the Nuku Nuku trailer, plus previews for Dragon Half, Sakura Wars, Burn Up Excess, Devil Hunter Yohko, Steel Angel Kurumi andPrincess Nine. She cooks, she cleans, and she beats up machines! All Purpose Cultural Cat Girl Nuku Nuku is a lot of fun, with great characters and some pretty hilarious situations. Its combination of absurd humor, action and a strange premise work very well together. The presentation here is nicely done, and contains the complete six OVA collection. Recommended!